What you eat before you sing can make all the difference to your performance. It can be confusing to know that many people can eat chips, drink pepsi or coke, even eat ice cream right at the mic and seem to suffer none of the vocal complaints that lay many others low. Yet voice scientists, doctors and vocal coaches frequently give long lists of things that you should never do if you want your voice to be healthy. Some people become afraid - almost superstitions- that eating anything before singing will sabotage their performance, and then they don't have enough energy to power and control their voice. Let me see if I can offer some balance here... for stage or studio. The voice is part of the human body, and as such is affected by what you take into the body. While some 'get away' with bad fuel for a time, good fuel is ALWAYS better for long term physical and vocal health, and bad fuel is ALWAYS detrimental -- even if you don't notice it till years later. People are different. They have individual metabolisms and health conditions, and some foods and drinks are nutritious for some, while for others the very same food and drink is poison. Some people take much longer than others to digest food, too... and that affects the time it should be eaten before singing. If you can't digest something or you are allergic to it, it doesn't matter how 'good' the food is- it still turns into poison in your system, cluttering up your body and your throat and stealing energy that could be used for... yes... singing! That said, here are some almost universally helpful things you can eat and drink (again if you are not allergic to them or have trouble digesting them). There's no way to overstate the need to get h2o into your body. You need to be getting water in well before you sing, and have some on stage, because moisture is lost from active vocal cords from air moving through the vibrating edges. During performance, I find that a little pineapple juice diluted with lots of water helps with vocal dryness better than the sprays, lozenges and gargles some people recommend. Eat a light, compact protein. This can be fish (my fav is salmon), avocado, raw nuts (if they don't stick in your throat), even eggs (if they don't cause excess mucous formation). Experiment on days you don't sing and keep a journal as to what seems to coat your throat too much and what just makes you feel energetic. A great vegetarian protein meal combines grains and legumes, such as rice, cornbread or whole grain bread and beans or peas. Hummus contains beans and grains, and is an excellent, quick choice when teamed up with some veggie sticks. Another very good way to get protein in is a fruit smoothie, best in the morning for those with sluggish digestive systems like mine. I don't digest fruit well later in the day, so I start my day with a blender full of frozen fruit plus a protein supplement like "Rice Protein" or a whey or soy or green pea-based product. I add a little juice and water or ice for good consistency, and various other nutritional supplements. Find out what works for you! Eat fresh and lightly cooked vegetables. That would mean salads, simple sides, crudites (raw veggie sticks) rock. I love to eat a pre-performance meal of sweet potatoes, salad and a side non-starchy green like asparagus, broccoli, green peas or green beans, often adding one of the proteins I mentioned above. Don't eat or drink heavy, drying or poisonous stuff! This would include saucy, complicated meals that make your stomach say 'What Is That?". KISS (keep it simple, silly). Don't drink a lot of caffeine (how much is too much? sometimes any at all will hurt you... know yourself and how your voice reacts). Don't drink black tea (it makes your throat feel dry). And it should go without saying, but I'm saying... don't drink alcohol or take drugs thinking they will help relax or energize you. You will lose some degree of vocal control - and then there's those pesky long term life & death consequences! Don't eat too much too close to performance. This can interfere with your breathing and your energy, which will be diverted to digesting your food. You need fuel...with time to process it into energy. How much time before performance? Experiment in rehearsal to know. Typically it's a good idea to eat a full meal an hour before singing, but in practical situations you can have a small snack just before if you haven't eaten... and the snack doesn't irritate or clutter your throat. OK, but what if you're in a hurry to get to the gig? My favorite artist eats potato chips before singing.. can I do that? Find out for yourself in rehearsal how something affects you. Don't trust eating or drinking the unknown at a performance. Just because you get by with something not good for you for a while doesn't mean you can continue. Be considerate of others. If what you are doing seems to cause indirect vocal problems in someone else, refrain from doing it at that gig. For singers and speakers, your body is your instrument. If you'd like to know how to eat for the long run, not just a gig, find out what specific foods act as “medicine” in your body or as “poison”. Consider meeting with a nutritionist or naturopath to receive the appropriate tests. Sometimes you don’t know how good you COULD feel, until you’ve made those key changes in your diet. 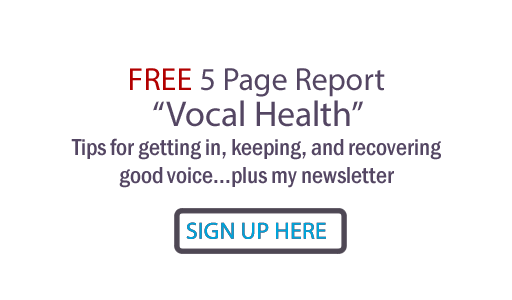 For more nutritional suggestions, sign up for my newsletter and get my 5 page report on "Vocal Health". What about you? Do you have favorite foods/drinks before singing? Have you eaten something that sabotaged your voice and that can be a cautionary tale for us? Share in a comment! As an Artist, I found your information and Recommendations to be both quite insightful helpful. Thanks for your wonderful contribution to this topic. An apple clears my throat. I thought that fruit smoothies coated your throat? Like orange juice or any fruit juice? Or is that not right? Anonymous... actually, it's according to what is in the fruit smoothie. Of course any dairy could present a mucous problem. As to fruit juice, I don't experience any problems with it, but people are so individual as to digestion and what causes excess mucous formation. I'd say note how it affect you and choose accordingly. Thanks for the thought about the apple! Good idea! I accidentally discovered freshly juices carrots helped my singing voice immediately! It simply cleared up my voice to the point that I went "whoa!" I experimented a number of times to make sure it wasn't coincidental. Worked every time. Hi Anonymous; interestingly, I drink fresh carrot and vegetable juice almost every morning. Besides many other nutritional and enzyme benefits, it balances ph and yes, tends to cut mucous and hydrate the throat tissues. This will definitely help the voice, as well as the rest of the body. Thanks for the thought... I highly recommend it as well. About 90 minutes before performing, scrambled eggs atop a toasted slice of Ezekiel bread. The right blend of slow-burning whole grain carbs and the protein to provide stamina. I don't do fruit the morning of, unless it is a very small amount of lemon mixed with a tablespoon of raw honey and very warm water. Hi... as to the eggs and Ezekiel bread... sounds like an energy breakfast, yes, IF eggs don't make you produce excess mucous or bother your stomach, and IF the combination of protein and carbs don't make you feel sluggish. Everyone is different. I would say to others about all new foods and all dietary approaches: try it on a non-performance day. See how it makes you feel, and how your voice works. Dear anonymous... it depends on your personal digestive system. Different people's digestion systems are more or less efficient than others. The banana smoothie can be good if you put protein powder in it and no extra sugar. You need protein for your performance, so the chicken sandwich isn't bad either. BEST: Try them both out on different days and notice which one makes you feel perkier and full of energy.. not weighed down, which heavier and more complicated meals can do to you. Also notice if either causes more mucous formation. Different people's digestion systems are more or less efficient than others. If you have a chicken sandwich, you might not want to put cheese on it because dairy can cause mucous. But again, some people are not very affected. Experiment on days you don't need to perform... keep a journal for a while noting how different meals make you feel and the condition of your vocal cords if you try to sing after eating. As to dry or liquid foods... it doesn't matter as long as you drink a lot of water before and during your performance. Get that hydration in even the day before. I have a singing performance tomorrow morning. Is there anything that I should or shouldn't eat or drink???? Hydrate well and follow the suggestions in this post. Good luck with your performance. I have a singing auition tomarrow ad im really nervous what do I do? Hopefully you're sleeping well. If you know your material well, just relax and do the best you can - that is all you can do. Focus on the person you're supposed to be singing to. Good luck. What about green tea, I heard green tea has anti inflammatory properties? I've been having that instead of coffee. Anonymous... yes, green tea does ... and is less dehydrating than black tea or coffee. Notice how it makes your voice feel... that is the best test of all. Hurray, at last I've found someone else finds black tea dries their throat; I've always found this, and also tap water, which seems odd. Other people have never really believed this. Hi, before a recent performance I ate an omelet with fresh vegetables. Is that bad? I don't know; how did your performance go? That's the defining answer. Some people find eggs mucous-forming, some don't. But an omelet with fresh veggies can be a great idea... protein plus the fresh or lightly saute'd vegetables can give you good energy. As long as it doesn't uncomfortably raise your gunk factor. Thanks, Judy. We are hosting Blackwood Legacy Quartet tonight at Newberry UMC (Newberry, FL). I wanted to provide some lite pre-service food choices for these great guys and your site was very helpful. Now, they'll select from fruit, veggie sticks, nuts, and simple turkey sandwiches. I've bookmarked your BLOG. Keep up the good work! Gary, your comment just makes my day! So happy to have helped you help them; bet they will be most appreciative of your thoughtfulness! Thanks for letting me know... and enjoy their concert! Hi. So i've been noticing that almost every time after i eat dinner, my voice ends up being very difficult to sing with. My voice feels stiff and scratchy in some areas and it's just overall a lot harder to maneuver my voice and get it to do what i want. Is this just a normal mucous coating the throat reaction to food? Or could this be signs of a more serious problem? Also, is there anything i can do to be able to eventually sing after dinner? Thank you for the help! 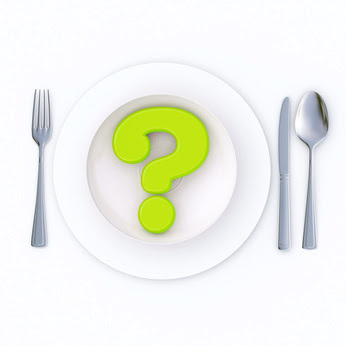 Try using food enzymes with dinner. Definitely don't eat til you're stuffed so your diaphragm isn't crowded by your stomach. If you still have trouble, get with a naturopathic alternative health provider or dietitian to find out what is hard for you to digest... and avoid it, especially when you will need to sing soon after dinner. as of me, im new to this music thing and within a yeah i have written up to 50 songs but my voice is not that great and im trying to improve on that but i dont know what to do. it is like i have mucous in my throat everyday and i cant sing with high pitch, i stopped drinking milk and start taking honey and warm water but i havent improve. i need help please. Oluwasegun, thanks for writing. Glad you're interested in improving as a singer. It's probably good that you are limiting dairy and adding honey to your diet. Sounds like you need better vocal technique; you can either get it free by reading blogs like this, or buy a course in vocal training like the ones on my site. Good luck with your songs! So glad you found this helpful, Joanne, thanks for the comment and I wish your children a fantastic performance Saturday night! I have a choir concert in like 3 hours and I found this article very helpful! Thank you so much!! How many eggs should I eat per day in order to improve my voice leading to a good singer? I wouldn't be able to tell you how many eggs to eat per day. You need enough protein and other nutrition to make you physically healthy. And you don't need to eat things that are too difficult to digest, that you're allergic to or which create toxic conditions in your system (bad fats, sugar, artificial ingredients, sodas, etc.). If this time without sugar...i hope you can help me answering that question .... Thanks!!! Hi Danny... ok, sugar is an instant high, and I've eaten a candy bar before singing when famished myself. However, it will end in an energy crash. It can also cause your energy to be too high, resulting in a lack of vocal control and resulting issues. Instead of simple sugar, eating complex whole-food sugars such as apple, fig, other fruits and vegetables is much better and healthier in the long run. You should also eat enough protein for performance. Eating and/or drinking a lot of simple sugar will rob your body of minerals and will eventually make you sick. For a quick boost of energy, try a protein smoothie. Easy and fast, full of ingredients to create stable energy to support your voice. I'm going to a performance in a few hours, I have lemon tea, cinnomon apple spice tea, and chamomile tea, which one is the best? Panda girl... well really it depends. Not sure what you mean by lemon tea but lemon water is good if you need de-gunking, cinnamon apple spice for soothing warmth to your throat tissues and chamomile could possibly be relaxing if you are stressed. I really prefer the diluted pineapple juice, but you shouldn't try anything for the first time right before performance. Try it at rehearsal instead. One more question, is it ok to eat chili before a performance? It depends on what's in it and if your stomach can handle it well. You do need protein and beef or turkey chili can provide that plus some good fiber. Two other things to consider: Does it give or take your energy? Does it add to phlegm in your throat? Use common sense, and if in doubt about how your digestive system handles a food or drink, save it to test before rehearsal, not performance.